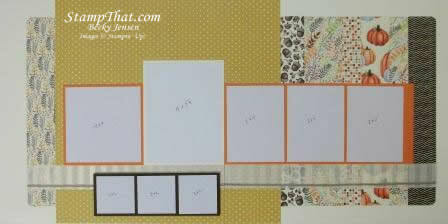 We are using some retired Designer Series Paper for one of our scrapbook layouts this month. I had some of this pretty paper left over from last year and wanted to put it to good use! I’m afraid I don’t have pictures to put on this layout yet, however, you can see where I plan to place them. I will send sizes to Scrap Club members in their email. I’m not quite sure what pictures I’m going to put on this layout yet. Any fall, Thanksgiving, colorful leaf, or outdoors pictures would look great! I look forward to seeing Scrap Club members soon!